Are democracy, capitalism, freedom and the concept of romantic love unique inventions of the West? No. In his new book, anthropologist Jack Goody shows that the superiority of the West is largely unreal, even if we look to the recent past. For example, it was always believed that democracy was born in Athens and in fact there appeared a particular form of democracy, but democracy existed first in Carthage, even in some cities in the Mediterranean, India, China and other “tribal” societies. Karl Max and Max Weber were wrong in their thesis about capitalism, because capitalism – despite the industrial revolution – was far more widespread. It was first a product of sowing cotton and the exploitation of silk in India and China. In another example, Goody explains how Elias and Braudel have overemphasized the European contribution in relation to modernity, when in fact this happened first in India and China. The concept of capitalism is rather a concept of the 19-century, says Goody, which should be used more carefully and has only been used for overvaluation of the differences between Europe and Asia. And in Asia, the reality was always more advanced than the West in art and science, even in what was considered romantic love. It was not a Western invention but is a universal sentiment that already existed. 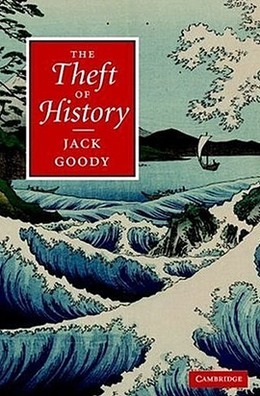 The ‘theft of history’ of the title refers to the take-over of history by the west. That is, the past is conceptualized and presented according to what happened on the provincial scale of Europe, often western Europe, and then imposed upon the rest of the world. After several years’ residence among African ‘tribes’ as well as in a simple kingdom in Ghana, I came to question a number of the claims Europeans make to have ‘invented’ forms of government (such as democracy), forms of kinship (such as the nuclear family), forms of exchange (such as the market), forms of justice, when embryonically at least these were widely present elsewhere. These claims are embodied in history, both as an academic discipline and in folk discourse. Obviously there have been many great European achievements in recent times, and these have to be accounted for. But they often owed much to other urban cultures such as China. The closer I looked at the other facets of the culture of Eurasia, and the more experience I gained of parts of India, China, and Japan, the more I felt that the sociology and history of the great states or ‘civilizations’ of Eurasia needed to be understood as variations one of another. The book has also been reviewed by The Canadian Review of Sociology and Keith Hart. Finally, something those of us in the land of no access to sources can read for free! Thanks for your comment. Yes, Keith Hart has become a very active blogger (although he posts more papers or articles than blog posts). The “Open source initiative” you mention, is not an initiative by Africanists, but by the ASA (Association of Social Anthropologists of the UK and Commonwealth). Their initiative ASA Online was announced somewhen last year and hasn’t been successful so far. Keith Hart is the first one to publish a paper there. Sorry, I see ASA and think Africa (African Studies Association) but, of course, you are correct. And I had the site up and was reading his piece and it still didn’t quite click. Thanks for the corrective. I only wish there were greater reason to hope.